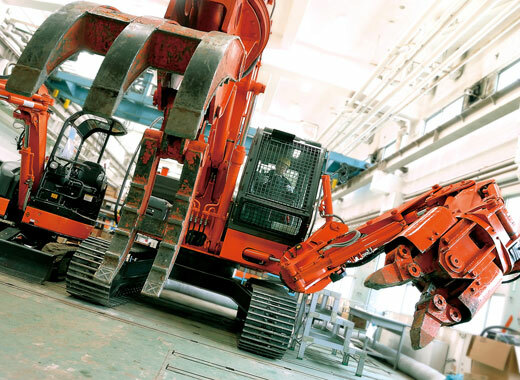 Japan’s No.2 construction equipment maker, Hitachi Construction Machinery Co,.Ltd developed a cool chunk of heavy machinery called ASTACO (an acronym for Advanced System with Twin Arm Complicated Operations, and it also means a crawfish in Spanish). Akinori Ishii, the developer of ASTACO, admits to being a big Gundam fan. For many years he kept thinking about a new type of working robot to improve the efficiency of decommissioning/demolition operations. In 2003 he won an internal corporate competition and his concept of “twin-arm machinery” was adopted. And in 2005 after overcoming many technical obstacles, the fist ASTACO made its debut. ASTACO also removed debris in the aftermath of the 3.11 disaster, in zones such as Ishinnomaki city and Minami-Sanriku town, Miyagi prefecture. ASTACO are still demonstration machines and only available on a built-to-order basis, so each machine costs several tens of millions of yen. It is urgently necessary to actualize mass production. Otherwise, this epoch-making machine will remain a mere curiosity. ASTACO has very unique operation system, so much more effort is necessary to open up new markets than to sell existing products. Many people in the construction/demolition industry are interested in this new-type of machine, but managers and executives may be reluctant to adopt it because ASTACO is too unique (or maybe financially risky) for them. Nevertheless, the young “Gundam generation” is very anxious to get behind the controls of that awesome machine! Improve Concentration?? Benefit of Putting on Geta and Zori Footwear!